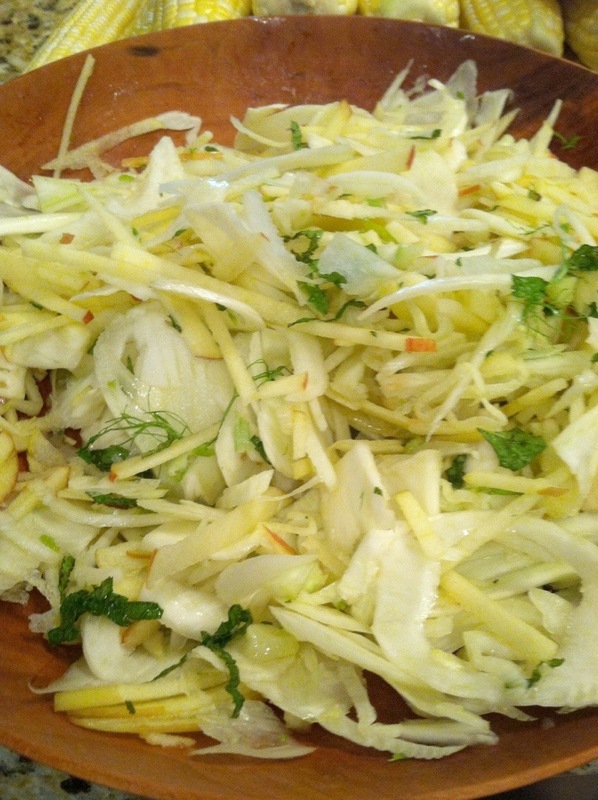 Summer Slaw for Sandwiches | sandwich surprise! Humidity is bumming me out right now. So I’m revisiting a Summer Slaw I whipped up last year — it’s terrific on burgers, hot dogs and steak sandwiches, and can easily carry a sandwich on its own. This slaw is juicy, crisp and refreshing. Plus, you can sub in whatever fruits are the freshest or ripest for the Macintosh apple. I’d definitely try pears, firm peaches or even pluots. The Inspiration: Dude, it’s gross outside. Two large fennel bulbs — Slice the bulbs crosswise as thinly as possible, and add in a couple of the stems and ferny leaves, chopped. 1.5 Macintosh apples — Julienne these, and again, feel free to experiment with other fruits. Two teaspoons minced fresh mint — I bet this would be delicious with fresh dill or tarragon as well. 1/4 teaspoon sugar — If you use peaches or pluots, I’d consider leaving this out. Whisk the liquids, sugar and mint together. Toss the dressing with the fennel and the apple until fully coated. This slaw makes a great salad with arugula and steak or chicken, too.